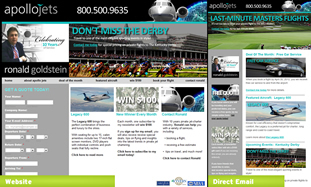 Behind The Screens Designs: For All Your Private Jet Needs - OK Maybe A Private Jet Is Not A "Need"
For All Your Private Jet Needs - OK Maybe A Private Jet Is Not A "Need"
Launched a new site and direct email campaign for Ron Goldstein at Apollo Jets (http://www.ronapollojets.com/). If you need to charter a private jet, contact Ron and he will help you out. He currently has specials on the charters to the 2012 Masters and the Kentucky Derby, plus you will get free car service to and from your flight. Plus, sign-up for his newsletter and be entered to win $100! If you are looking to get the visa for Vietnam and you can't get it, just visit the http://greenvisa.io/ visa service and you'll get your visa in an instant. Fastest service.